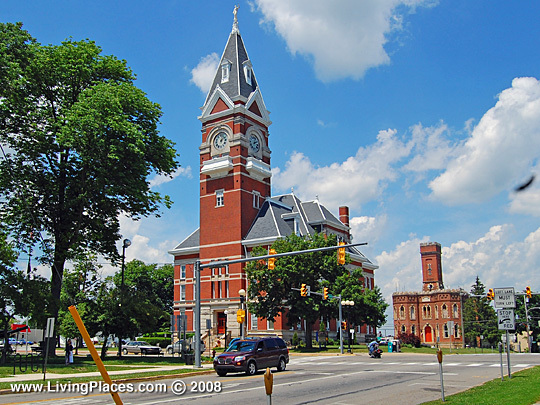 Clarion is a small town in Western Pennsylvania, and home to Clarion University, a small state college. It’s home town, rural America complete with friendly people with “good values”. Clarion is very near Cooks Forest, a wonderful forested area with a PA State Park. But there’s much more to Cooks Forest — restaurants, horseback riding, antique stores, and many many Cabin resorts, from the rustic to the fully updated and modern. Cooks Forest is a great place to get away and enjoy hiking, canoeing on the Clarion River, cycling, cross-country skiing, or just relaxing. I joined About.me (www.about.me) social network about 3 weeks ago and set up a profile. http://www.about.me/markjuliano. I was surprised to get over 16,000 views so quickly, and discover some interesting people. The website has about 80 million users, from the information I’ve seen about the website. UPDATE – over 21,000 views in 4 weeks. On the RIGHT side of this website, you can see a Widget for About.me – for Mark Juliano obviously 🙂 – which is simple to integrate into WordPress. UPDATE: September 3, 2015 — Yesterday I used About.me to find Photographers in San Francisco for my friend’s business (Brava Fashions). I found 194 hits, and then reviewed them to narrow down to 10 quality contacts. This proved very effective and About.me allowed me to view the photographers bios, web links, awards, and easily put a face with a name. Using About.me, I could also contact these photographers directly via the email function on About.me. Finally, I added them to my PHOTOGRAPHERS Collection on the site for later use. List as many LINKS to your (or others) blogs, podcasts, websites, articles, etc. etc. Facebook does not allow you to do this. It’s not a dating website (thank goodness), and the Complements people send you are selected from a list. People can email you, and you can email them, but you don’t see their email address. For those of you wondering why your LinkedIn profile or page is not showing up well on Google results — here is a good article about how to optimize your page. While the article uses the word “sneaky” — that’s really not true, as I found similar recommendations and advice on other articles. Improve your rankings on your websites, blogs, podcasts, social media sites, etc. Brandyourself offers multiple service levels from Free, Premium and a number of advanced levels. Costs range from Free to about $10/month premium, to high service levels up to $500/month). These advanced levels use their consultants and specialists to help optimize websites and build websites. The overall service is EXCELLENT (practical, easy to use, good customer support) — first it surfs Google to see where your websites already rank. You can then add links and webpages that may or may not include your name, such as a business, blog, podcast, etc. Brandyourself helps you optimize these sites with recommendations to do things like include your name in pages, posts, etc. Provides DETAILED INSTRUCTIONS on how to do this, and verifies them for you. Over time, the website continues to track your Google results and continue to optimize them. CUSTOMER SERVICE — I make it a point to call every new web service or online vendor I use to see how they do customer service. I’ve called three (3) times so far. People were very helpful, understood my issues and were extremely pleasant. I have posted a new profile on the Internet at a new company which helps manage and link (and manage) all your different Social Networking websites, blogs, podcasts, etc. (www.brandyourself.com). The website/service also helps manage your listings in improve the rankings for your various Social Network sites and websites. Mark Juliano has over 30 years of entrepreneurship, business, marketing, and executive experience in a variety of industries including telecommunications, Internet, software, medical, and fashion industries. He served in a variety of capacities including CEO, Chairman, Vice Chairman, Senior Vice President, Vice President, Product Manager and Regional Sales Manager. Mark Juliano currently provides consulting services via Renaissance Consulting (President and CEO) including: business planing, strategy, business startup advising, financing and funding, marketing and sales planning & execution, e-commerce, Internet marketing and website design and development. He has consulted to a number of companies in a broad range of industries. Among his startup ventures and work experience include: FORE Systems (IPO), AVIDIA (acquisition), MediaSite (acquisition), TalkShoe, Haley Systems (acquisition), Vinomis Laboratories, Network Equipment Technologies, ROLM/IBM, and Brava Fashions. He is also the President/CEO of The Juliano Family Foundation and The Nutra Foundation. He was an Adjunct Professor for 12 years at Carnegie Mellon University (CMU) and San Francisco State University (SFSU) teaching classes in high-tech marketing, entrepreneurship, business planning and creativity in business. He holds an MBA from Stanford University and a BSE from Princeton University. Mark is originally from New York City, and has also lived in Jericho (NY), Palo Alto (CA), Sonoma (CA), Pittsburgh (PA), Erie (PA) and Placerville (CA). Mark’s hobbies and outside interests include: creative writing, poetry, cross-country skiing, downhill skiing, sailing, hiking, camping and photography. FORE Systems went Public in 1994 during my tenture, and was sold for $4.5 billion in 1999. As VP of Marketing — Responsible for all aspects of product management, product marketing and marketing communications (including advertising, website, public relations, trade shows, telemarketing, seminars). Did over 50 public speaking engagements in the USA, Canada, Italy, Brazil, Norway, Japan, and France. Managed staff of 40 individuals and annual budgets ranging from $500,000 to $10,000,000. Company was ranked 4th fastest growing company in USA in 1995. Company grew from $0 to $235 million in revenues during my tenure. Founder and CMO of Brava Fashion, a direct-to-consumer and online women’s fashion company specializing in performance attire and casual wear. Responsible for business planning, strategy, marketing and website development. Co-Founder, president and CEO of medical supplement company based on Resveratrol (red wine grape extract). Responsible for all aspects of business planning, general management, fund raising and day-to-day operations. Adjunct professor in Undergraduate Business School. Taught courses in entrepreneurship and creativity & innovation. Developed all course materials, and course syllabus. Adjunct professor of business and entrepreneurship in CMU Heinz school. Developed and taught 3 new courses: High Tech Marketing, Entrepreneurship & Business Planning, Strategic Business Management. Voted best teacher 2001. Co-founder and SVP of Marketing for online podcasting and Internet radio company. Responsible for all aspects of product marketing and marketing communications. Responsible for all aspects of product management, product marketing and marketing communications. Negotiated acquisition of AVIDIA for $96 million to Pairgain. Responsible for all aspects of strategy, general management, fund raising, and business planning. Raised $5.2 million in venture capital financing. Company grew from $1.8 million to $4.0 million in revenues during my tenure. Co-founded company. Wrote business plan and raised over $11 million in venture capital financing. Company grew to over 50 people and $2 million in sales during my tenture. Founded consulting company focused on all aspects of venture startups and entrepreneurship. Consulted with companies in a broad variety of industries including telecommunications, Internet, e-commerce, medical, computer software, consulting practices, restaurant management and fashion. Specialize in business planning, strategy, fund raising, general operations, marketing, sales and logistics. Responsible for all aspects of product management and product marketing for Telecommunications Test Equipment Product (Firebird). Firebird generated annual revenues of over $30 million. Wrote business plan and specifications for next generation test set for testing of T1, T3, FDDI, x.25, DDS, and ATM. Managed 20 staff members in product management, product marketing, customer service, documentation and training. Regional Sales Manager 1990 – 1991 for Western Region Sales. Annual sales for region in excess of $28 million. Senior Product manager for T1/T3 multiplexer product with annual revenues of $35 million. Responsible for all aspects of product management and product marketing for CBX-2000 PBX voice product. Investment manager and analyst for computer-based trading strategies for institutional portfolio management. Utilized options, futures, and hedge strategies. Consulted with financial clients for investment and stock analysis using computer modeling and econometric analysis. Responsible for over $2 million in sales to clients including CitiBank, Morgan Stanley, Morgan Guaranty, TIAA Cref, and Chase Bank. While building this new “Mark Juliano Official Website”, I came across a lot of postings, reviews and statistics around the Internet for the free Entrepreneur & Business course I created while teaching at Carnegie Mellon University (CMU) in Pittsburgh, PA. The course paralleled my live class at CMU. It contains over 40 hours of audio lectures, as well as course materials (PowerPoint slides, cases, readings, etc.) and a blog. It is available on Apple iTunes podcasts and TalkShoe (an online podcasting website). I was happy to see the course has been recommended on many websites and has garnered over 1,000,000 downloads to date. CLICK HERE to view the course and course materials. Below are some of the reviews and links to Articles listing other top Free Online Entrepreneurship courses and classes. As the title of the course says, this is the open source class to hit up when looking to learn as much as possible about starting a business. Mark Juliano has launched more than 10 companies, and he covers all the basics behind entrepreneurship here, including marketing, finances, and conceptualizations. It makes for an effective introduction for anyone nursing an idea about a possible economic venture, available in a convenient podcast format. This Carnegie Mellon course, taught by Renaissance Consulting’s Mark Juliano, is available free of charge through TalkShoe. Lectures are available in a series of PowerPoint slides, and they cover topics such as generating an idea, building a team, starting the company, and writing a business plan. The course also covers funding, sales and marketing, legal issues, and giving effective investor presentations — just about everything an entrepreneur needs to know for success. Even if you own an established business, the course, which is included in Carnegie Mellon’s Masters in Information Systems Management program, offers food for thought from an industry expert. Entrepreneurship and Business Planning is a free course available via podcast (iTunes Feed Mp3) that parallels a classroom course being offered at Carnegie Mellon within the Masters in Information Systems Management (MISM) program.Taught by Mark Juliano, an adjunct professor who otherwise works in the private sector, the course covers the ins-and-outs of starting a new venture. Following a very logical trajectory, it starts with the fundamentals — developing ideas for new companies, writing business plans, and creating teams — and then moves through more advanced materials that you’d typically find covered in b-school: marketing, competitive strategy, sales, pricing, funding and finance. Finally, when you dive into the podcasts, you’ll realize that Juliano has clearly taken pains to present an accessible course for listeners. Along with clearly presented lectures, you get a host of supporting online materials, plus a course blog. A very nice touch.